The first chapter illustrates the manner in which businesses can gain dominance over social media networks. Emily Goldstein in the book notes that shopping in the contemporary scene is social, because individuals desire to purchase things after reviewing the experiences of others with the products in the social media. The author discusses the uses of Twitter and its impacts on many businesses, and notes that businesses can use it to establish better relations with their clients. Emily also notes that entities using Facebook have had higher returns on investments as well as those using Instagram in the example of McDonalds and Lewis. She encourages business people to join such sites and set goals relevant to the value of the product offered and the target audience. The second chapter elaborates the means of making money from social media platforms. One of the ways given is using sponsored tweets that enable users to tweet ads. Such tweets promote brands and raise revenues. Emily also provides avenues for making revenues in Facebook through communication using posts in their pages on the site. The book also emphasizes on setting Instagram goals, mastering the use of hash tags and using YouTube videos to publicize brands because visual content is more appealing compared to text. The third chapter indicates the celebrity aspect of the social media and the large amount of money made by such stars when they endorse products or companies. Using case studies of several celebrities such as George Foreman, 50 Cent and Kim Kardashian, the author details how such celebrities gain millions of dollars from endorsements. Emily notes that celebrities gain much from tweets meant to endorse some products as well as YouTube videos meant to promote the products. The book offers guidance on prospective users of such sites such as providing exclusive value, gaining followers on the sites, rewarding supporters as well as avoiding offensive words. She cautions on over-doing things and advises making efforts to endorse products and services. The fourth chapter addresses the aspect of branding and the vital role of the concept in marketing and advertising. She identifies various elements related to branding including the name given to the products, the attractive colors that ought to be used for them and the logo that acts as a visual trademark of the company. A key aspect addressed in the topic is the relation between brands and the colors used for the advertising, which should be distinct and memorable. Emily notes that Blue is a favorite color for branding in many social media sites, although other colors can be utilized based on the products offered. Further, brand names ought to be short, captivating and easily memorable. The fifth chapter dwells on the business perspective of the subject, enlightening readers on tracking and calculating the returns on investment (ROI). 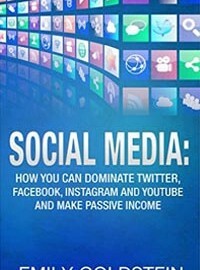 The author notes that this helps the individual to estimate how much investment they will be willing to place in the social media. She indicates that calculation of ROI on the social media platforms follows a formula given by the gains made minus the money invested and dividing the result by the money invested. In the estimation of the aspects in the formulae, specific goals should be established, tracked and then monetized. Further, individuals should understand the aspects of Google analytics that help to identify the impact of the entity on the social media platforms. The sixth chapter deals with Search Engine Optimization, a crucial aspect of being noticed within the website platforms. To increase the gains from SEO, the author recommends that businesses gain more connections with their followers, develop social signals such as online communities and use links on the online platforms that can be followed by prospective clients. Entities can also use shortcuts to increase SEO by interacting with visitors on their sites, increasing followers and using key words in their sites that are easy to search. Readers are also encouraged to optimize their domain names and make their social sites active with products and posts. Chapter seven highlights the means to gain followers on the sites, which increases the search engine rankings of the websites. The author offers various means to attract followers including aggressive advertisement of products on social media sites, offering rewards to followers, developing unique content as well as posting captivating issues on the sites. To gain twitter following, the book advises individuals to follow celebrities, build their profiles, provide interesting tweets and boost activity within the site. On Facebook, individuals can establish their company pages, advertise on other pages and share public posts. Entities using Instagram ought to fill out their bios and follow other people, while on YouTube catchy titles should be used and post videos regularly. Chapter eight discusses the aspect of social media marketing as the means to building wealth. Emily notes that social media marketing is vital and inevitable for contemporary businesses. Therefore businesses ought to sell the benefits that their products give, choose suitable social media platforms and optimize the profiles on such platforms. Further insights offered are refreshing content on the social media pages, monitoring the activities of competitors, incorporating Google analytics for tracking progress and offering some free content with an aim of gaining publicity. Finally, businesses should establish mobile connection with users on mobile devices and use Twitter Advanced searches to realize the needs of prospective buyers of their products. The final chapter of the book provides the parting shots of the author. The chapter gives ways in which users can generate content regularly, estimate results and maintain progression. This is by creating content, performing regular updates on it and using Google Analytics to measure the results against the goals set. Further, insights are offered on optimizing websites and other social platforms through attraction of traffic, detailing the product pages of the company and selecting the right e-commerce solutions that work effectively and efficiently for the users. Emily notes that maximization of revenues in the sites can be done by optimization of content, boosting conversion rates and mobilizing clients to check-out. Finally, the book highlights common mistakes done on social media including concentrating on some sites, lacking social media buttons or hash tags and lack of images accompanying posts in the pages.